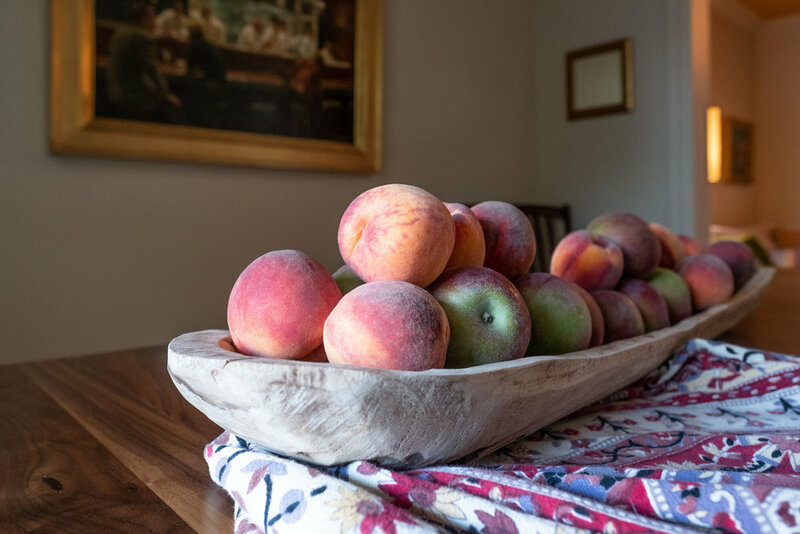 It was soul satisfying to see the wooden trough on the dining room table overflowing with apples and peaches but eventually I had to decide what to make with all that gorgeous fruit. I wanted a recipe that was simple, unfussy and forgiving. I wanted to make something that would fill our home with a wonderful aroma. Something comforting, delicious and nourishing to eat. A fruit crumble checked all the boxes. A crumble is simple to make and requires these simple things: a greased pan that’s just the right amount deep, a fruit filling and a crumbled topping. Your fruit of choice is washed, prepped, coarsely chopped and tossed directly into a greased baking dish with some flavouring. Be mindful of how much sweetener you add to the filling; more if you use rhubarb and less if you use peaches. I didn’t need to add sweetener to my apple and peach filling. For flavouring I used lemon, cinnamon and freshly ground nutmeg. This topping, made with coconut oil and almond flour instead of the usual butter and flour, is delicate and crunchy. These are great substitutions for the usual flour and butter if you need to go the vegan and gluten-free route and even if you don’t. 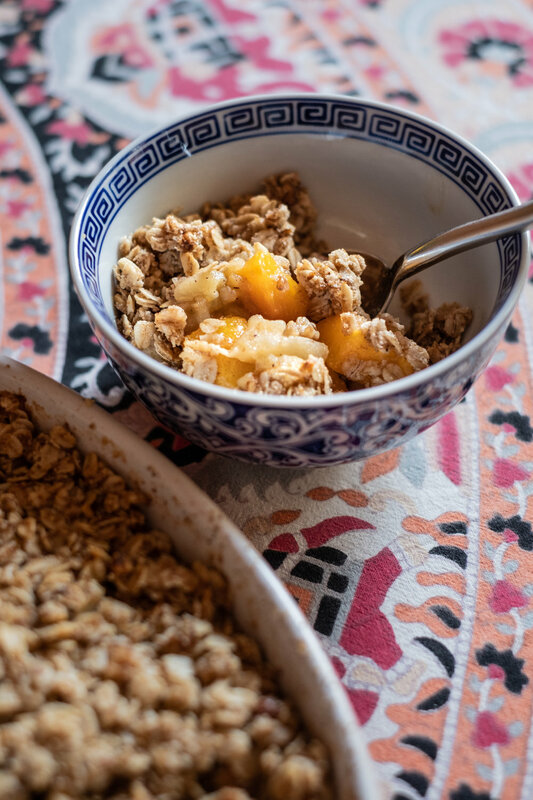 This fruit crumble stands firmly on its own as a weeknight dessert or dress it up with a dollop of cream (non-dairy or otherwise) for a special occasion. It’s also delicious to eat for breakfast with a steaming hot cup of green tea. 5 large apples. I used MacIntosh apples. Lightly grease an approx. 9'“ x 7” baking dish. Peel, core and chop fruit into chunky pieces. Place the apples and peaches in baking dish. Sprinkle cinnamon and freshly ground nutmeg over the fruit. Add the lemon zest and juice and lightly toss. In a large bowl place almond flour, rolled oats, walnuts, sugar, and salt. Mix with a fork to combine. Add the coconut oil and continue to blend with a fork until combined. Sprinkle crumble topping over the fruit. Try to work on a depth half that of the fruit. Too thick and the middle won't cook. Press the topping down with your hands or the back of a large spoon. Place in preheated oven and bake for 40-45 minutes or until golden and you can see the fruit bubbling through from underneath. Remove from the oven and leave to stand for 5 minutes before serving.